Robert A. Siegel Auction Galleries: Robert A. Siegel - United States Treasures: The William H. Gross Collection Auktion ist bereits beendet! 1847, 5¢ brown orange. 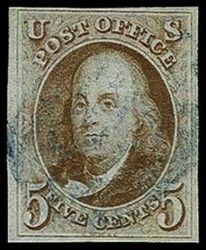 Without gum, wide margins, rich bright...mehr 1847, 5¢ brown orange. Without gum, wide margins, rich bright brown orange color; flaws including filled thins and faint crease not detracting, Very Fine appearance, an extremely rare shade in mint condition, with 2018 P.F. certificate. Scott No. 1d; $4,500. 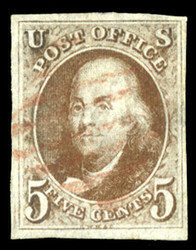 ONE OF ONLY FOUR RECORDED MINT EXAMPLES OF THE 1847 5¢ ISSUE IN THE BROWN ORANGE SHADE. 1847, 5¢ red brown, horizontal pair. 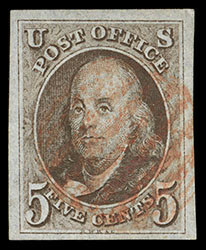 Four margins, strong color...mehr 1847, 5¢ red brown, horizontal pair. 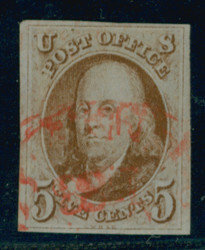 Four margins, strong color on deeply blued paper, tied by red circular grids on blue 1851 folded cover from the Whelan correspondence to Philadelphia Pa., matching "Saint Louis Mo. '10' Jul 1" integral cds, Extremely Fine, with 1990 P.F. certificate. Scott No. 1; Estimate $7,500 - 10,000. 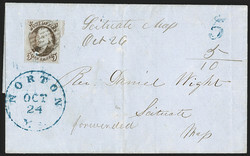 ONE OF ONLY TWO RECORDED 1847 ISSUE COVERS USED ON JULY 1ST, 1851, THE FIRST DAY OF DEMONETIZATION. 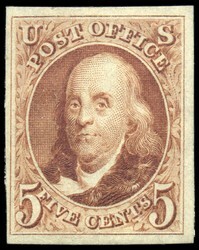 This was the first day on which the 1847 issue stamps were no longer valid for the payment of postage, according to the demonetization of June 11, 1851. The other July 1st, 1851 cover was used from New York City. 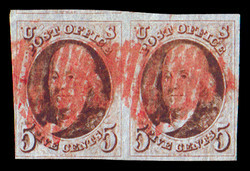 1847, 5c red brown (Scott 1), vertical pair, ample to large...mehr 1847, 5c red brown (Scott 1), vertical pair, ample to large margins all around, red New York square grid cancels, fresh and Very Fine, vertical pairs of the 5c 1847 are uncommon and quite desirable, with 1989 P.F. certificate. Scott $850. Estimate $400 - 600. 1847,5c rotbraun (Scott 1), senkrechtes Paar, ringsum voll- bis breitrandig, rot New York Rostrechteckstempeln, frisch und Pracht, senkrechte Paare des 5c 1847 sind ungewöhnlich und geradezu begehrenswert, mit 1989 P. F. Attest. Scott $850. Schätzpreis $400 - 600. 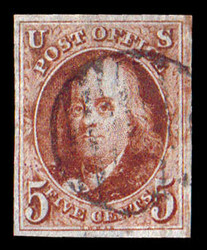 1847, 5c red brown (Scott 1), horizontal pair, just clear at...mehr 1847, 5c red brown (Scott 1), horizontal pair, just clear at lower left to large margins all around including portions of the stamp above at left, red New York square grid cancels, Fine to Very Fine. Scott $850. Estimate $350 - 500 The pair is from a later printing of the plate as the impression is somewhat worn. 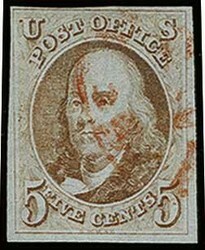 1847,5c rotbraun (Scott 1), waagrechtes Paar, unten links Lupenrand bis ringsum breitrandig inklusive Teile der Briefmarke oben auf der linken Seite, rot New York Rostrechteckstempeln, feinst bis Pracht. Scott $850. Schätzpreis $350 - 500 die Paar ist von einem später Druck der PL als die Abschlag ist etwas abgenützt. 1847, 5c red brown (Scott 1), glowing red grid cancel, vibrant...mehr 1847, 5c red brown (Scott 1), glowing red grid cancel, vibrant & sharp color and impression within mostly generous margins, Very Fine, with 2017 P.S.E. certificate. Scott $375. Estimate $200 - 300. 1847,5c rotbraun (Scott 1), glühend roter Gitterstempel, kraftvoll & scharfe Farbe und Abschlag innerhalb großteils großzügige Ränder, Pracht, mit 2017 P. S. E. Attest. Scott $375. Schätzpreis $200 - 300. 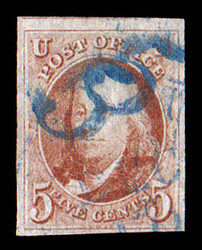 1847, 5c brown (Scott 1), large margins all around with portion...mehr 1847, 5c brown (Scott 1), large margins all around with portion of adjoining stamp at right, with blue numeral "5" in circle cancels, beautiful deep, rich color; tiny thin in center, Very Fine to Extremely Fine centering. Scott $465. Estimate $200 - 300. 1847,5c braun (Scott 1), ringsum breitrandig mit Anteil einer angrenzenden Marke rechts, mit blau Ziffer "5" im Kreis Stempeln, schöne tief, intensive Farbe; gering hell in Mittelstück, Pracht bis äußerst gute Zentrierung. Scott $465. Schätzpreis $200 - 300. 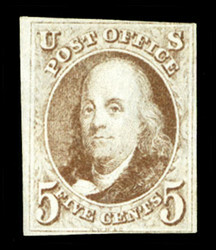 1847, 5¢ dark brown. 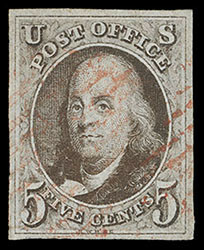 Light red grid cancel; large well...mehr 1847, 5¢ dark brown. 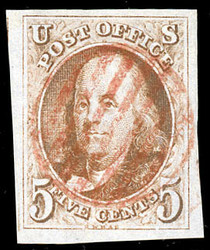 Light red grid cancel; large well balanced margins, rich dark brown color and a detailed early impression, Extremely Fine and attractive, with 1996 P.F. & 2002 P.S.E. certificates, the latter Graded (XF 90, SMQ $1,200). Scott No. 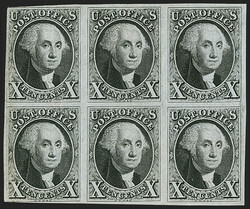 1a; $800. 1847, 5c red brown (Scott 1), fake green "5"...mehr 1847, 5c red brown (Scott 1), fake green "5" cancellations, eye-catching example that's been enhanced by the colored cancel; a real looker, Fine. Scott $375 for normally used example. Estimate $200 - 300. 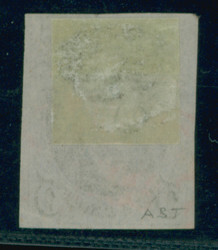 1847,5c rotbraun (Scott 1), gefälscht grün "5" Entwertungen, auffallend Beispiel thats gewesen steigerte von dem bunten Stempel; ein realer looker, fein. Scott $375 für normalerweise gestempeltes Stück. Schätzpreis $200 - 300. 1847, 5c red brown (Scott 1), red grid cancellation,...mehr 1847, 5c red brown (Scott 1), red grid cancellation, exceptional example showing portion of sheet margin at left; a lovely sound example with warm, rich color, Very Fine, with 2011 P.F. certificate. Scott $375. Estimate $300 - 400. 1847,5c rotbraun (Scott 1), rot Gitterentwertung, außergewöhnlich Beispiel mit Anteil von Bogenrand auf der linken Seite; eine herrliche gutes Stück mit warme, satte Farbe, Pracht, mit 2011 P. F. Attest. Scott $375. Schätzpreis $300 - 400. 1847, 5c orange brown (Scott 1b), nice double-struck "5"...mehr 1847, 5c orange brown (Scott 1b), nice double-struck "5" numeral cancellation, premium example of this desirable shade; ample margins all around; a lovely fault-free stamp, Very Fine, with 2014 P.S.A.G. certificate. Scott $790. Estimate $600 - 800. 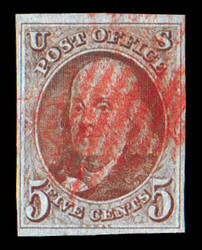 1847,5c orangebraun (Scott 1b), schöner double-struck "5" Ziffer Entwertung, Zuschlag Stück dieser begehrenswert Farbton; ringsum breitrandig; eine herrliche fault-free Briefmarke, Pracht, mit 2014 P. S. A. G. Attest. Scott $790. Schätzpreis $600 - 800. 1847, 5¢ red brown. 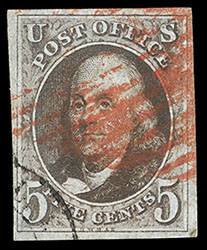 Red grid cancel, ample to large margins,...mehr 1847, 5¢ red brown. Red grid cancel, ample to large margins, bright color, Very Fine, with 1984 P.F. certificate. Scott No. 1; $375. 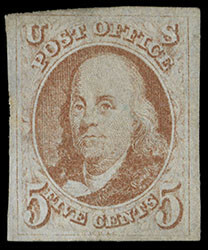 1847, 5¢ red brown, dot in "S" variety. 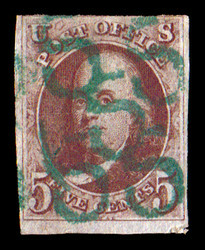 Red grid and town...mehr 1847, 5¢ red brown, dot in "S" variety. Red grid and town corner cancels, ample to large margins, rich color, Very Fine, with 1987 P.F. certificate. Scott No. 1 var. 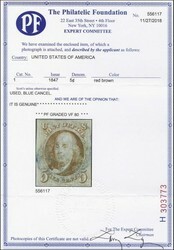 ; $400. 1847, 5c red brown (Scott 1), beautiful red grid...mehr 1847, 5c red brown (Scott 1), beautiful red grid cancellation, superior GEM quality example with unusually large margins and heavenly rich color; a great stamp, Extremely Fine to Superb, with 2011 P.S.E. 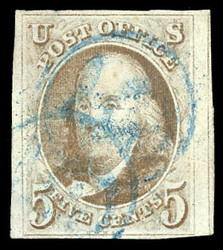 certificate graded XF-SUP 95. SMQ XF-SUP 95; $1,300. Scott $375. Estimate $1,000 - 1,500. 1847,5c rotbraun (Scott 1), schöne rot Gitterentwertung, hochstehende Luxusstück mit ungewöhnlicher breite Ränder und himmlisch intensive Farbe; eine großartige Briefmarke, äußerst fein-Pracht, mit 2011 P. S. E. Attest eingestuft XF-SUP 95. SMQ XF-SUP 95; $1,300. Scott $375. Schätzpreis $1,000 - 1,500. 1847, 5¢ brown. 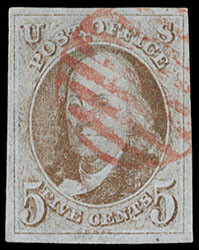 Near complete strike of red "Scarab" cancel of...mehr 1847, 5¢ brown. Near complete strike of red "Scarab" cancel of St. Johnsbury, Vt. full margins, Very Fine, a choice full strike of this rare and desirable fancy postmark, with 2004 & 2012 P.F. certificates. Scott No. 1; Estimate $500 - 750. 1847, 5c orange brown (Scott 1b), black circular grid cancel, lovely...mehr 1847, 5c orange brown (Scott 1b), black circular grid cancel, lovely example of this premium shade, unmistakable orange-brown; small corner crease at top left and small purple ink dots at bottom left, Very Fine, with 1999 P.F. certificate. Scott $825. Estimate $250 - 350. 1847,5c orangebraun (Scott 1b), schwarz Kreis Gitterstempel, herrliche Stück dieser Zuschlag Farbton, eindeutig orange-brown; kleiner Eckbug oben links und kleines purpur Tinte Punkte unten links, Pracht, mit 1999 P. F. Attest. Scott $825. Schätzpreis $250 - 350. 1847, 5¢ brown. 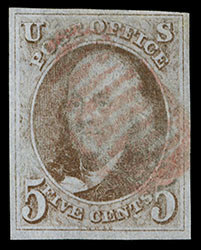 Light complementary red grid cancel, ample to mostly...mehr 1847, 5¢ brown. 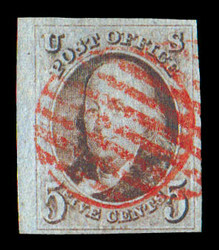 Light complementary red grid cancel, ample to mostly large margins, beautiful early detailed impression, Extremely Fine and choice, a striking stamp. Scott No. 1; $375.